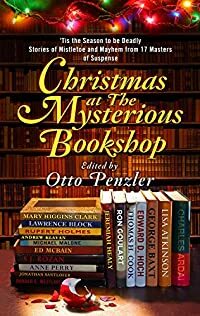 Christmas at The Mysterious Bookshop by Otto Penzler, editor, a Mysterious Review. Review: In an introduction to Christmas at The Mysterious Bookshop, editor Otto Penzler, owner of said establishment, writes, "As a way of thanking our customers for their support, I have commissioned an original story from some of the finest mystery writers in America each Christmas season for the past 17 years." The only criteria given to them, he adds, is " … that the stories should be set during the Christmas season, involve a mystery, and have at least some of the action take place at The Mysterious Bookshop" in Manhattan. The tradition — and indeed, that's what it has become — began in 1993 with a story written by Donald E. Westlake and continues to the present, with 2009's story written by Mary Higgins Clark being the most recent. Seventeen stories are included in this collection, and what an outstanding one it is. Yes, they're all well written and devised, but probably more importantly, they're all uniquely personal: many of the authors include Penzler as a character, often having him interact with their own series characters. There is so much joy on these pages and affection for Penzler — the man who says, in character at the end of a story by Jeremiah Healy, "God, but I love this business!" — that it's hard for the reader not to feel good while reading them. A must have for any fan of mystery or suspense, Christmas at The Mysterious Bookshop is an ideal gift to give this holiday season. It is highly recommended. Here is a list of the contributing authors, alphabetically with the year of their story indicated in parentheses: Charles Ardai (2006), Lisa Atkinson (2004), George Baxt (1994), Lawrence Block (1997), Mary Higgins Clark (2009), Thomas H. Cook (2003), Ron Goulart (1996), Jeremiah Healy (1998), Edward D. Hoch (1995), Rupert Holmes (2005), Andrew Klavan (2007), Michael Malone (2002), Ed McBain (1999), Anne Perry (2001), S. J. Rozan (2000), Jonathan Santlofer (2008), Donald E. Westlake (1993). Acknowledgment: Over the River Public Relations provided an ARC of Christmas at The Mysterious Bookshop for this review.